The Sun God, Surya, the god of energy and of the life-force, is worshiped during the Chhath Puja to promote well-being, prosperity and progress.Chhath Puja 2016 will commence from November 4- 7. 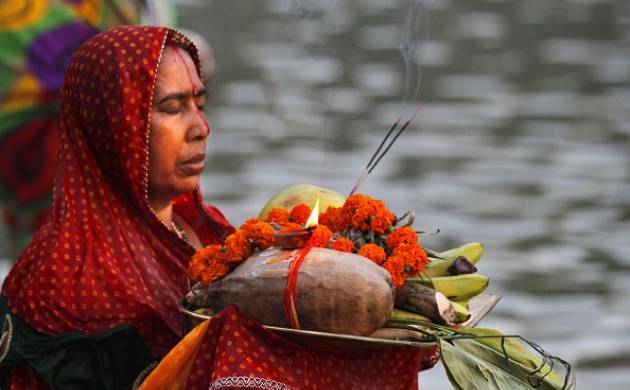 Chhath Puja 2016 will commence from November 4-7, in Chhath Puja the Sun God, Surya, the god of energy and of the life-force, is worshiped during the Chhath Puja to promote well-being, prosperity and progress. Chhath Puja is also known as Surya Shashti, Chhathi and Dala Chhath. There is always a right time for everything so the same goes with Chhath Puja when devotess will worship Lord Surya and gain the positive energy in order to eliminate all your negativities. Lord Surya will surely grant your wishes. Nahay Khay: Nahay Khay, Nahai means to bathe, and Khai means to eat. On the first day of Nahai Khai, devotees take a holy bath in a holy lake or river, to purify their sins. Then, they worship Lord Surya. Water from the holy river is carried to homes, which is later used in cooking food offerings for Surya. Kharana: On Kharna, devotees observe Vrat for a time-period of almost 8 to 12 hours. This fast includes abstaining from drinking water. Thus, the day of Kharna involves an anhydrous fast. People terminate the fast during evening after performing Surya Puja.With the end of Surya Puja, Prasad (sacred food offering) is distributed among everyone. Sandhya Arghya: Sandhya Arghya means evening offerings. On the third day of Chhath puja, devotees prepare food offerings. The prepared food is offered to the setting Sun. The setting Sun is worshiped on Sandhya Argha. It is considered auspicious to invoke the blessings of Surya in dusk. Usha Arghya: The fourth and the final day, also known as Suryodaya Argh is the day to offer early morning prayers to the God of life and energy followed by 'Parana' where devotees break their fast after 36 long hours.